Vehicle Mode: I’ve only transformed Screecher, as the propellers and wings are somewhat delicate. Other than the wings and propellers, they don’t feel quite as delicate as Knight Morpher Cyclops (AKA Shockwave) but I didn’t want to risk it. It should be noted that Mastermind Creations is aware that some of these parts can be easily broken and has provided their retailers with replacement parts. With that being the case, I’m less worried about these than I would have been otherwise. They are incredibly impressive in vehicle mode and look to be virtually identical to the art from the comic book. The three level bat wing design looks great, and the coloring is perfect. 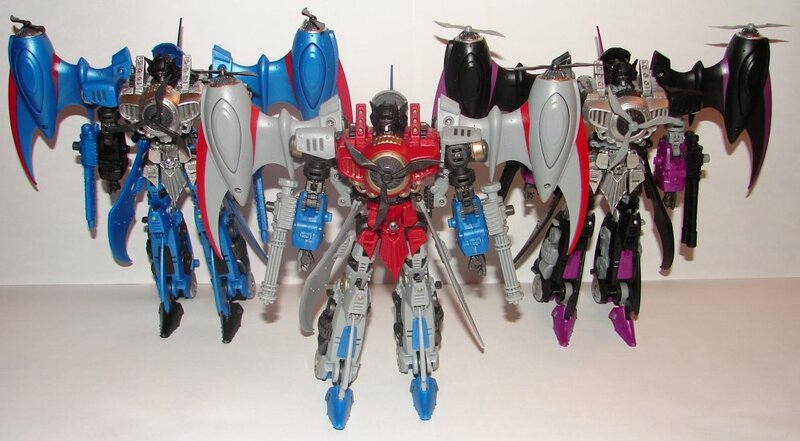 I must admit, I prefer the alternate art for this toy that was in one of the comics with Starscream being a biplane with four propellers, but this design is very cool. He has flip out wheels on the bottom that can run on the train tracks that Knight Morpher Commander (AKA Optimus Prime) can run on. I think they can actually be connected as cars to Knight Morpher Commander, but I haven’t had time to check. Robot Mode: They look awesome in robot mode, spot on perfect reproductions of the artwork in plastic. The art for these was drawn without any kind of existing toy (as far as I know) and it’s truly amazing that the toys were designed to be so faithful to the art. Each one has a different face. 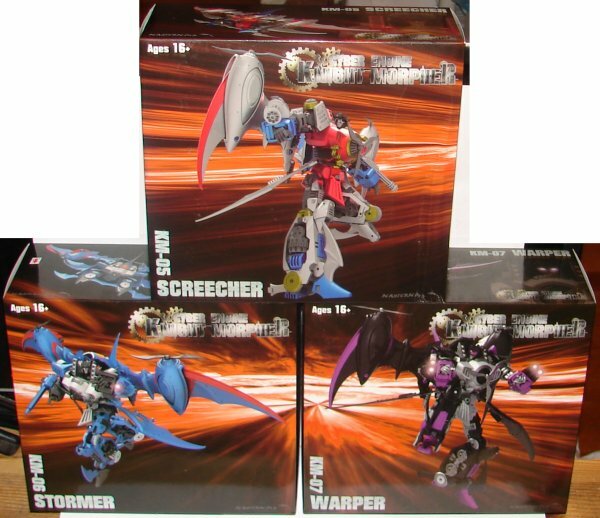 Screecher is appropriately smirking, Stormer is expressionless, and Warper has his mouth open in a scream. They did include a second head with Warper, probably because the scream looks a bit silly. It has the same expressionless face as Stormer. 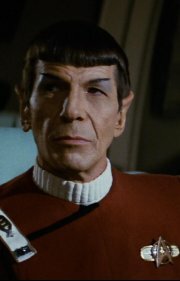 Warper also included a second pair of hands in a lighter gray. I’m not really sure why, unless it was just a option to make him look a little more different than Stormer. The other major difference between the three is their weapons. Screecher has a gatling gun, Stormer has a cannon of no specific type, and Warper has a double barreled cannon. Overall: If you aren’t a completist, and will only get one of these, at $85, the price really isn’t too bad. Of course, if you want all three it does get a bit expensive, but I think they are worth it. Just be aware that since some of the parts are delicate, you may not want to play with them too much. This entry was posted in Toys, Transformers and tagged Hearts of Steel, Hearts of Steel Skywarp, Hearts of Steel Starscream, Hearts of Steel Thundercracker, Knight Morpher, Knight Morpher Screecher, Knight Morpher Stormer, Knight Morpher Warper, Screecher, Skywarp, Starscream, Stormer, Thundercracker, Toys, Transformers, Warper. Bookmark the permalink.